The previous week had seen ridiculous quatities of the white stuff arrive from the sky and the Scottish ski hills managed to get all their lifts (okay all except one at Nevis Range) running at all 5 areas during this weekend - quite possibly a record for the third week in March! Much of the low level snow had started to thaw by the weekend but the stuff that was left made walking difficult at best and impossible at worst. As a result the vast majority of the group took to skis on the Saturday with a cross-country group and several ski touring groups heading off in various directions. The cross-country group experimented with various methods of crossing burns on skis, some of which were successful, other less so. 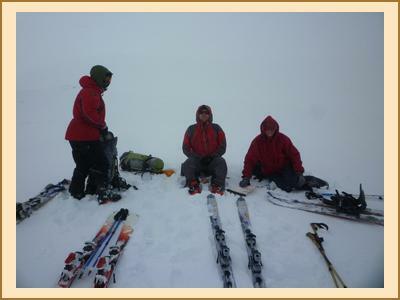 The ski tourers all headed for Glenshee and promptly managed to lose each other in the murk. Mike and Fiona hid in the summit shelter on the Cairnwell waiting for the cloud to clear - it did but only after they skied back to the car park and bought a lift pass. Anne C, Gillian, Sara and Pete managed to get to Carn a'Gheoidh despite some interesting snow features and navigation. Kenny went downhill skiing at the Lecht. The remaining club members were split between a walking party and a climbing party. The walkers decided on the Munros of Beinn Bhrotain and Monadh Mor. Even without the snow this is a big day. They returned after 11+ hours having managed Beinn Bhrotain with the second hill being left for another day. 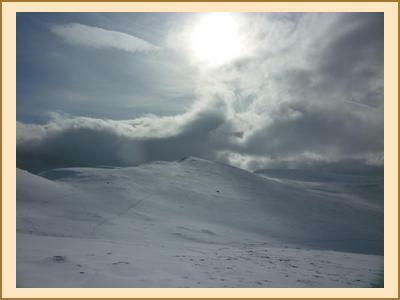 The climbers also had an equally long day, wading through waist deep snow to get to the corries of Lochnagar. They ultimately decided that their route could also wait for another day. On Sunday, the group was split again between skiers and walkers. The majority of the skiers headed for Glenshee where the visibility ranged between poor to very poor thanks to the low cloud. Amazingly, two of the Beinn Bhrotain party still had the energy to wander up Morrone.